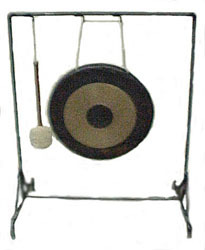 A percussion instrument of Chinese origin, consisting of a large, round, thick disk of metal suspended in a frame and struck with a padded stick. When it is struck it produces a very loud sound with a fundamental note and rich overtones. Even though the gong produces a fundamental pitch, it is typically considered to be untuned percussion or a non-pitched instrument.